Pakistan is suffering a scorching heatwave with temperatures reaching in the high 40s away from the coast. The port city of Karachi has recorded temperatures of 45 degrees with an escalating death toll now numbering up to 800 people according to Al Jazeera. The National Disaster Authority has been mobilised to assist people and to educate people on how to prevent heat stroke. 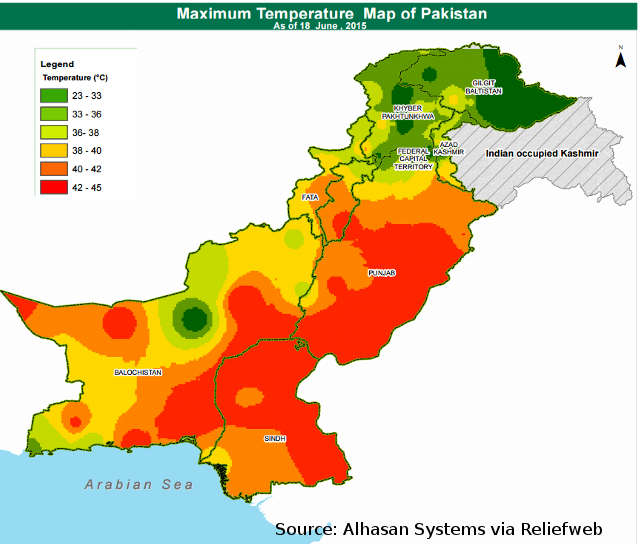 Military forces have also been mobilized to establish emergency camps to help with rehydration and treatment of heatstroke, according to a Government of Pakistan report published at the United Nations Reliefweb. The onset of the Heatwave occurred as the Festival of Ramadan commenced which mandates fasting for healthy adults during daylight hours. Forgoing food and water with scorching temperatures poses additional health risks, especially to more vulnerable people such as the elderly, the young, or those already sick. A prominent Islamic cleric, Tahir Ashrafi, has urged those who were at risk of heatstroke to abstain from fasting, according to a report in the Guardian. "We [religious scholars] have highlighted it on various television channels that those who are at risk, especially in Karachi where there is a very serious situation, should abstain from fasting,” he said. "Islam has drawn conditions for fasting, it is even mentioned in the holy Qur’an that patients and travellers who are not able to bear fasting can delay it and people who are weak or old and are at risk of falling sick or even dying because of fasting should abstain," he concluded. Most of the official deaths have been in the southern port city of Karachi where temperatures in the surrounding Sindh province reached up to 45C on Saturday. CNN reports that at least one city morgue has been overwhelmed with the numbers dead. The Sindh provincial government has declared a state of emergency in relation to government hospitals and medical personnel. Compounding the issue is the frequent power outages for extensive periods of the day, so that even those with air-conditioning or fans find they are unable to utilize them for much of the time. More concerning is that the power outages have disrupted and hampered pumping stations for Karachi's water supply system. The K-electric power company that supplies electricity around Karachi and the provincial Sindh government have been criticised for failing to avert disaster. Not even the heat could deter angry protesters taking to the streets protesting K-electric accusing authorities that they should have anticipated the overwhelming demand on the grid caused by the combination of extreme heat and evening demand caused by Ramadan. Prolonged load shedding & water shortage in Karachi caused death of 150 people. K-electric & Sindh govt responsible for criminal negligence. Federal ministry of water and power and k electric are responsible for current situation of Sindh. 20 hours load shedding in rural Sindh. As of Tuesday 23 June, the official death toll stands at over 600 people. Compensation for heatwave victims of Rs 5lac each has been offered to bereaved famillies. The Pakistani government is even considering cloud seeding in an effort to cause rain to modify the heatwave impacts. Far northwest India and neighboring Pakistan are dealing with intense heat as they wait for monsoonal rains to arrive which are slowly pushing through India, expected to reach Delhi by the end of June. Climate change impacts have a low public perception in Pakistan according to this report. According to a study carried out by the Lancet/UCL commission on health and climate change, only 15% Pakistanis perceive climate change as a major threat, 25% say its a minor threat, 20% think it is no threat at all, while 40% answered don’t know or refuse climate change. The heatwave comes after more than 2000 official deaths reported during a scorching heatwave in India. The first five months of 2015 were the hottest on Record with El Nino still ramping Up. NOAA data shows that the initial five months of 2015 were the hottest on record by a substantial margin. Hitting 0.85 C above the 20th Century average, this global heatwave beat out the previous hottest such period during 2010 by a substantial +0.09 C margin. Read more at Robert Scribbler's blog: NOAA Shows El Nino Yet to Have Full Impact on Global Temperatures — More Severe Warming During 2015 Likely in Store. The 2014-2015 El Nino is already the most intense since 1997-1998, with climate models predicting Strong-to-Monstrous Potential, according to Robert Scribbler. A positive Indian Ocean Dipole now seems likely along with El Nino, which will reduce rainfall and add to drought impact in much of south eastern Australia, according to this report by Peter Hannam in the Sydney Morning Herald. Climate Change is likely to triple the impact and frequency of positive Indian Ocean Dipole effects on Australia according to 2014 research.